I know there are a million different amazing flavours of Easter eggs you can get nowadays but my very favourite is the good old speckled mini eggs. There is something perfect about that crunchy pastel candy coating with milk chocolate centre. I can devour entire bags worth. So for the Easter round for Baking for Hospice, I wanted to recreate my fav Easter egg as a cake. 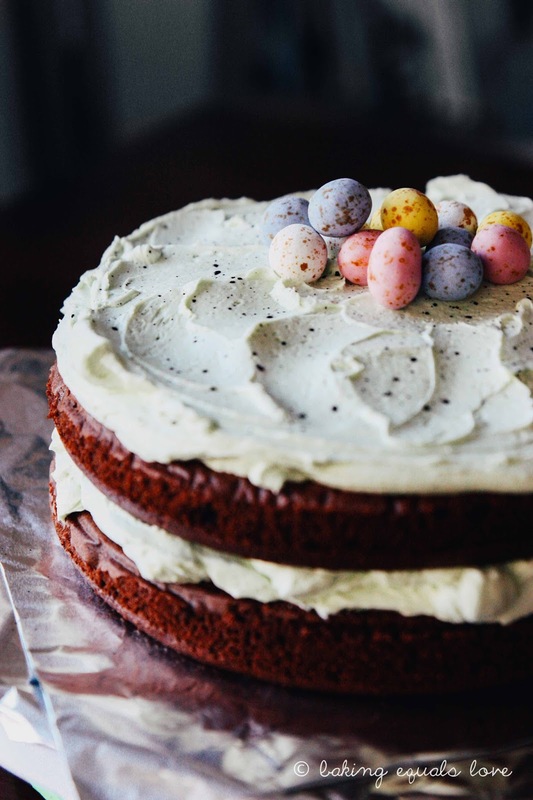 I've not had a lot of experience with decorating layer cakes and must confess have never been a fan of simple buttercream which I find far too sweet. So I did a spot of pinterest research to look for a suitable frosting recipe and discovered this glorious whipped vanilla buttercream frosting from the amazing Sweetapolita, which I have slightly adapted. It is so light and creamy, perfectly vanillary and not too sweet at all. And it is beautiful to work with. Total buttercream convert. The chocolate cake part is just my go to chocolate cake. You can process up the dry ingredients beforehand and keep in a zip lock bag or small jar as your very own cake mix. I always have a bag on stand by in the pantry for cake-mergencies. 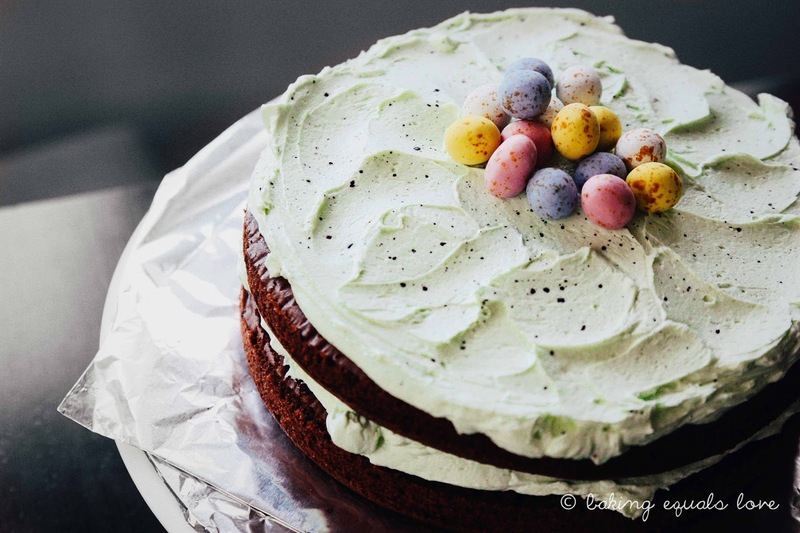 I literally made this cake in 1 hour from start to finish: was running late so had to use a fan plus the freezer to cool the cake - which isn't necessarily ideal but just goes to show how quick and easy this cake is to make in a pinch! 1. Preheat the oven to 180oC with oven rack in the middle of the oven. Spray bottom and sides of two 25cm spring form baking pans with baking spray and line with a circle of baking paper at the bottom. 3. Make a well in the centre and add the wet ingredients (oil, water, eggs, vanilla and sour cream). Beat with with hand held beater or cake mixer for 1 minute on high speed. Evenly distribute the the cake batter between the two baking pans (I weighed the pans). 4. Bake at 180oC for 20 minutes until toothpick comes out clean. Allow to cool for 2 minutes in pan the carefully transfer to cooling rack to cool completely before frosting. 300g butter, cubed, at room temperature. 1. In a large bowl with a hand held beater or with a cake mixer with the paddle attachment, cream the butter for 6 minutes, starting on medium speed and working up to high speed. Scrape down the sides at half way. The butter will become very pale and fluffy. 2. Add all the rest of the ingredients into your bowl and beat on low for around a minute to incorporate then on medium-high speed for 5 minutes, scraping down the sides at half time. 3. 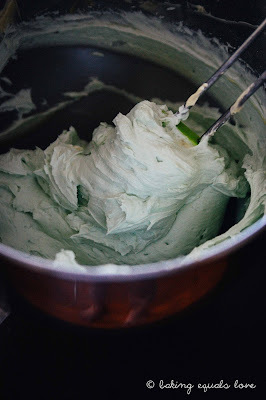 If you are colouring the frosting, with all the ingredients in and the frosting getting its last good whipping - add the food colouring one drop at a time allowing each drop to fully incorporate before adding the next one. This might sound tedious but if you are looking for a light pastel colour it is absolutely necessary as the difference between say baby pink and bubblegum pink can be as little as 1 drop! 4. For the best consistency for piping and spreading, use rightaway. If using to pipe do small batches at a time as it can melt with the heat of your hand if you have warm hands. 1. When the cake is completely cold, check the layers to see if they have pretty much flat tops. If they have a peak then you might have to use a serrated knife and level the tops off. If they are pretty much flat, place one layer upside down on a cake board. 2. If you are using a turn table, place the cake board on top of the turn table. Top with a dollop of frosting (roughly half the frosting) in the middle of the bottom layer. Use your pallet knife to spread the frosting to just before the edge of the bottom layer of cake. 3. Place the second layer upside down on top of the frosting. Place the remaining frosting as a big dollop in the middle of the top layer. Using your pallet knife again, evenly spread to the edges. Then using your dessert spoon, lightly brush the curve of the spoon over the top of the cake in little half moons to create a rustic look. 4. Dip the tips of your brush into your dark food coloring and using your finger tip bend the bristles back and flick the dye on to the frosting. Start further away and move in to get a better gauge of how speckly your particular brush is. 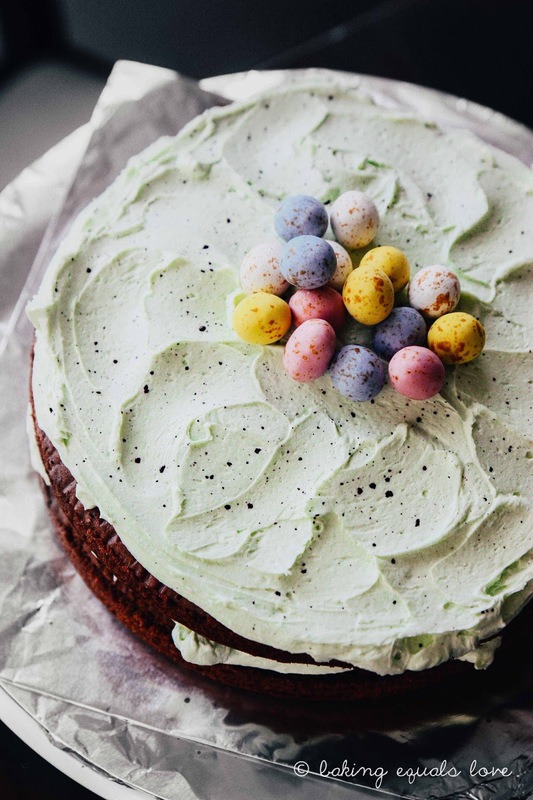 Once you are happy with the amount of speckling, decorate with chocolate speckled Easter eggs. Simply a beautiful cake! I love making cakes. Once I took part in cooking events at a local event space. Everyone liked my cake as used unique ingredients to decorate it. Even got first prize for my creativity and efforts. Beautifully decorated cake, Nessie! Also, I hope the rest of your pregnancy goes well. Wishing you the best for a smooth delivery.